The General Agreement on Tariffs and Trade (GATT) was created alongside other towering achievements of the post-World War II era, including the United Nations, the World Bank, and the International Monetary Fund. GATT, the first successful agreement to generate multilateral trade liberalization, became the principal institution to administer international trade for the next six decades. 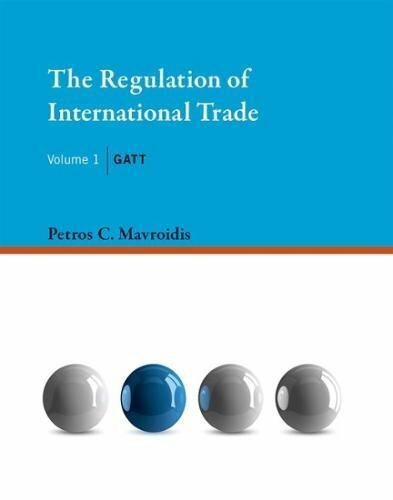 In this book, Petros Mavoidis offers detailed examination of the GATT regime for international trade, discussing the negotiating record, policy background, economic rationale, and case law. Mavroidis offers a substantive first chapter that provides a detailed historical background to GATT that stretches from the 1927 World Economic Conference through Bretton Woods and the Atlantic Charter. Each of the following chapters examines the disciplines agreed to, their negotiating record, their economic rationale, and subsequent practice. Mavroidis focuses on cases that have influenced the prevailing understanding of the norm, as well as on literature that has contributed to its interpretation, and the final outcome. In particular, he examines quantitative restrictions and tariffs; the most favored nation clause (MFN), the cornerstone of the GATT edifice; preferential trade agreements and special treatment for products originating in developing countries; domestic instruments; and exceptions to the obligations assumed under GATT. This book's companion volume examines World Trade Organization (WTO) agreements regulating trade in goods. About: The General Agreement on Tariffs and Trade (GATT) was created alongside other towering achievements of the post-World War II era, including the United Nations, the World Bank, and the International Monetary Fund.